It's hard not to see these great Archie Horror titles through the lens of their live-action brethren CW's Riverdale and Netflix's Chilling Adventures of Sabrina. The eerie and shocking events of the printed page take on a whole new aesthetic as they're fleshed out on screen with sometimes outlandish and sinister twists. 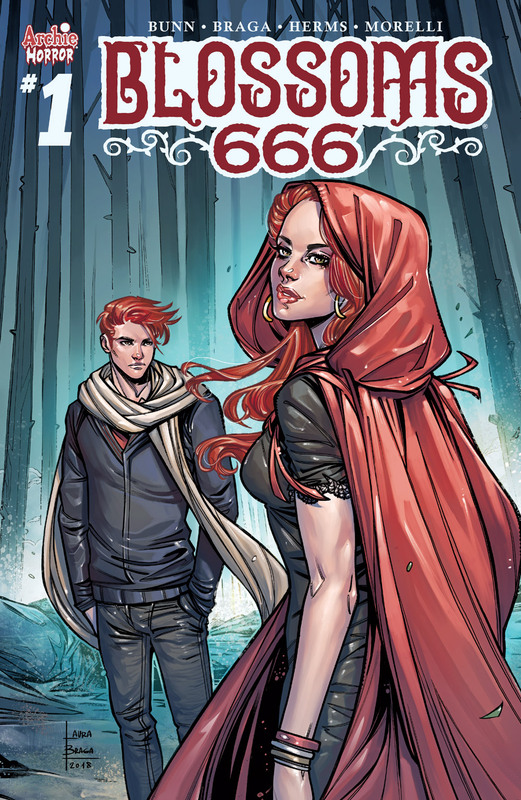 A title like 'Blossom 666' with writer Cullen Bunn, artist Laura Braga, and colorist Matt Herms isn't subtle but who better to introduce the macabre than the privileged and manipulative Blossom siblings, Cheryl and Jason. As the creator of Harrow County, Hellbreak, and Wolf Moon, Bunn knows all about suspense and horror. He uses his talents here to give the Riverdale crew a tension-filled slow burn of an opening chapter. The normally aloof and snooty Blossoms have invited everyone at school to a big party at their mansion. They've even begun coming to the aid of people like Jughead and Dilton. Seems perfectly natural that they would help the kids they usually looked down their noses at, right? Nothing suspicious there. Having Cheryl and Jason approached the other students to invite and intervene in their troubles helps to introduce the characters and establish this version of Riverdale. It's a set-up for sure but Bunn's dialogue is crisp and economical leaving you waiting for the hammer to drop as this tale is destined to take an evil turn. So we wait but the story is so expertly executed that you're already invested in this party and what possible reason could the Blossoms have to be so inviting and helpful. Laura Braga is one of my favorite artists and Matt Herms is a constant professional as the colorist. Braga's style is more mature than the traditional Archie style creating characters that seem more realistic than cartoony. They end up looking older than high school teenagers much like they do on the 'Riverdale' TV series. Herms bold colors are rich and hearty giving the book a heavy atmosphere that adds to the tension. Everything the team does is purposedly moody and it pays off in looking especially dark but inviting. 'Blossoms 666' #1 is a great first issue that lays the foundation of the Blossoms' plan to compete for the title of the Anti-Christ by involving all your Riverdale favorites in an eerie and shocking plot.